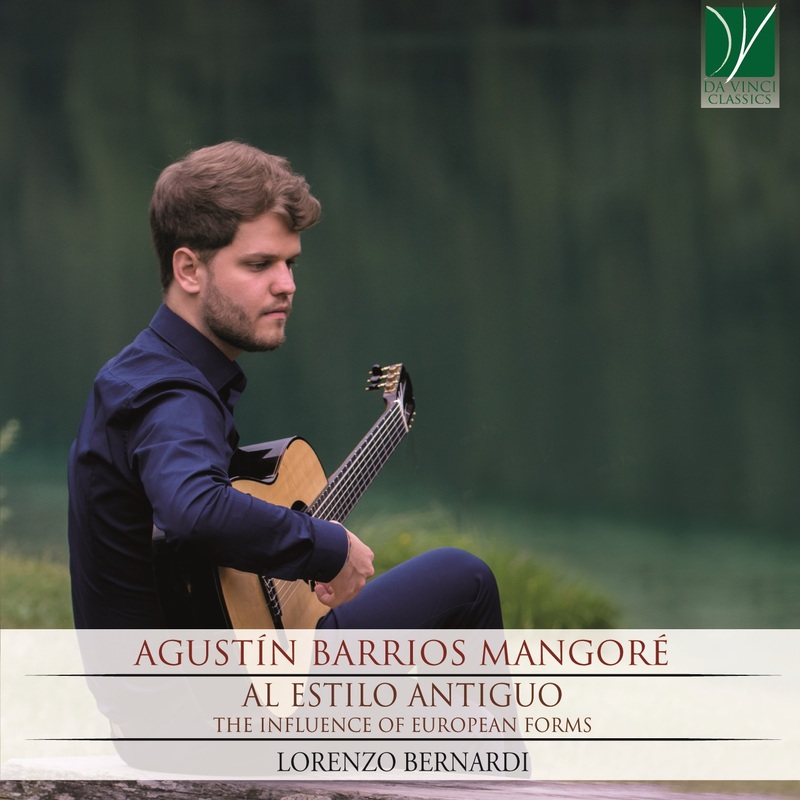 This album is the culminating point of a research project that started as a dissertation at the Conservatorio “Canepa” of Sassari (Italy): The influence of the European forms in the work of Agustin Barrios. In that investigation, some works from the rich output of Agustin Barrios were chosen for analysis: despite their wide differences, they all shared an explicit reference to a form (or a composer) of the European tradition. Arbitrary as it may seem, this selection proves to be an interesting avenue to access the complex personality and artistic endeavor of Barrios, and this CD is the sounding companion to that research. Agustín Pío Barrios was born in the Paraguayan province in 1885, from a well-to-do and cultivated family. Since his youth, he displayed a vivid talent that pushed him to pursue a humanistic education, not limited to his musical genius: he was a philosopher, a poet, a graphic artist and illustrator, and a theosophist. Despite this wide range of talents, his guitar abilities were soon recognized as extraordinary and brought him to immediate fame through Latin America. His tireless travels took him to visit practically every corner of the continent, meeting a success that only Andrés Segovia could match (and later surpass). This extraordinary career has a tangible testament in his numerous recordings (first among guitarists, even before Segovia, Barrios understood the importance of music recording) and in his output as a composer. His music, popularized outside of Central and Latin America beginning in the 1970’s, and since then part of the standard guitar repertoire, is as rich and diverse as the persona of its composer. Certainly, the folkloric influences of his music are easily recognizable, and they are part of the reason of his wide popularity in today’s guitar repertoire, but there is more than that. “Al estilo antiguo” refers to Barrios’ intellectual voraciousness, open to an assimilation of styles and forms inherited from the European tradition. The preludes, in their refined simplicity, are among the deepest compositions of the Paraguayan composer. The reference for the genre is J.S. Bach, through the lenses of the highest Romantic inspiration. Barrios proves to be familiar with Chopin’s Preludes (at their turn an explicit homage to Bach’s works). The ostinato writing on the Preludio en Do menor emphasize a recurring melodic gesture in the top voice, while the Preludio en La menor is more open to harmonic exploration through a careful and balanced voice leading. The two studies included in this recording have differ a lot between each other. The Estudio en Sol menor is meditative in nature, transcending the usual brilliant writing in favor of a prelude-like texture. In contrast, the Estudio de concierto is reminiscent of the Estudio Brillante by Francisco Tarrega in its typical virtuosic writing. Its cascade of arpeggiated notes is wisely distributed across the range of the guitar, associating the change of keys with a change in timbre. It’s hard not to see the influence of Chopin’s music in the next two pieces in the track list. The Mazurka apasionada recalls a genre that the Polish composer brought to fame, adding a descriptive Spanish title that clarifies its Romantic inspiration. The always prominent melody is gently accompanied by an often-modulating harmony, through the chromatic bass that is so typical of Barrios. The Waltz was also a genre in which Chopin excelled, bringing it to the concert stages from the ballroom. Barrios’ Op.8 no. 3 is a piece that found the place it deserves in the modern guitar repertoire: lively and melancholic, it has all the features of a short romantic piece being at the same time a perfect example of Barrios’ unique blend of styles. In Medallón antiguo Barrios goes even further back in history to find his source of inspiration: it is an explicit homage to the old Masters of the Vihuela (“A la manera de los antiguos vihuelistas”, says the subtitle). In fact, the sonority of the piece and its harmonies hardly recall the renaissance Spanish instrument, but it is certain that Barrios puts an extra care in the construction of the counterpoint and in the independent movement of the voices. The delicate minuet that follows is a plain simple melody that models the classic style, with many chromatic movements in the lower voices to add some spice to it. Confesión is again in the Romantic style, and it could very well be a Song without words modeled after Mendelsohn. What strikes the listener here like in many other compositions by Barrios is the coexistence of simplicity and complexity, of the immediate and a good sophistication, in a natural blend that tells us how Barrios mastered his instrument and the compositional technique. When composing a Gavota the obvious reference is the Baroque era (Barrios probably had in mind Bach’s examples of this noble dance). This is immediately evident by the presence of the double anacrusis and with a melody that perfectly matches the metric accent. The Baroque model is also present in one of Barrios’ most famous compositions: the three-movements La Catedral, which from its very title reminds us the solemnity of a religious construction. We can speculate about the likelihood of the anecdote that has Barrios finding his inspiration by listening to music coming out of a cathedral (of La Havana? Or rather in Uruguay? ), but what matters is that this piece is one of his highest achievements as a composer. The prelude (added in 1938 to the initial two-movements piece) is again a not-so-hidden homage to the art of Bach, with its simple melody in longer rhythmic values accompanied by a sequence of arpeggiated chords. The Andante works as a solemn introduction (with the dotted rhythm) to the flamboyant Allegro that again reminds us of some moto perpetuo ending of some of Bach’s suites or Partitas, compositions of which Barrios was very much aware. Lorenzo Bernardi: Born in Trento in 1994, he graduated from the Conservatory F.A Bonporti of Trento in 2015. He then continued his studies under the guidance of Emanuele Buono at the Conservatorio L. Canepa in Sassari, obtaining a Master’s degree with honors. Thanks to a scholarship offered by the European community, he further specialized at Conservatorio de Musica Manuel Castillo in Seville, Spain, under the guidance of internationally renowned Professor and guitarist Francisco Bernier. As a soloist, but also as a member of chamber ensembles and with orchestra, he has performed in numerous national and international events. Between 2016 and 2018 he performed in prestigious events of international importance in Spain, Argentina, Bahrain, Japan, Korea, Indonesia, Vietnam and India where he was also invited as a jury member of international competitions such as Calcutta International Guitar Festival in India , Alma Hanoi Guitar Festival and Saigon Guitar Fest in Vietnam. In 2016, concerts were held in Mendoza, Argentina, within the Semana de las Artes festival, at the Universidad de Cuyo and at the local Consulate General. In 2017 he made his debut in Japan performing in Tokyo, Osaka and Fukuoka thanks to the support of the Italian Institute of Culture in Osaka. And shortly thereafter in Spain, within the famous festival and international competition Festival de la Guitarra de Sevilla, playing at the Real Alcazar of the famous Andalusian city. In 2018 he performed in duo with the virtuoso Ukrainian Marko Topchii at the Trento Philharmonic Hall and with the Vietnamese guitarist The Le, in May 2018 in Manama, Bahrain. The tour in Vietnam, which saw him perform in Hanoi and Ho Chi Minh City, dates back to June 2018, where he also had the opportunity to hold a Masterclass for local students followed by a second tour, about two months, which at starting in October, he took him to perform again in Vietnam and later in Korea and Indonesia. In December 2018 he made his debut in India performing in many cities on a tour organized by the Indian Guitar Federation where he had the honor of being among the artists invited to the VIII Calcutta International Guitar Fest.